Blogalong: Noun. 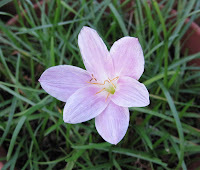 A plant you learned about through garden blogging and planted in your own garden. If the plant was given to you by another blogger, it is a blogalong passalong. Forgetia: Noun. One of several temporary botanical names which are useful until the actual botanical name of the plant can be discovered. Gads: Noun. The inclination of some gardeners to bounce around from one garden task to another in a seemingly disconnected or unplanned fashion. Can also be a verb, gadsing, as in “gadsing about the garden…” It originally started out as an acronym, GADS, Gardeners Attention Distraction Syndrome. Gardenetics: Noun. The study of gardening and genetics combined, particularly when it relates to the study to determine if the genetics of gardeners is different from that of the general population. Haughtyculturist: Noun. A snooty horticulturist. First used in the book Of Flowers and a Village by Wilfrid Blunt. It is not a compliment to be called a haughtyculturist! Hortonnection: Noun. Short for horticultural connection. This refers to the garden-y connections that gardeners have with one another, making us more connected than the general population is. In other words, I’m more likely to know some of the same gardeners that other gardeners know, without knowing that they know them, too, because we are all gardeners. Hortothesis: Noun. Any hypothesis that relates to horticulture or gardening. Hortotropism: Noun. The phenomenon of attraction between gardeners, often noticed in social settings. Over time, gardeners will find each other in a group of people and gradually isolate themselves from the rest of the group to discuss all manner of important topics like “what is your signature squash”, “do you believe compost tea is that beneficial”, or “how do you pronounce Clematis”. Paradeisosphobia: Noun. The fear of gardens. The fear of gardening is kipourikosphobia, by the way. If you discover other new words I should add to this list, please let me know. And don't forget there is another post with acronyms related to garden blogging, which may also be useful. Let me know if there are any updates for it, too. Now, go study for your quiz! Thanks for naming my disease - Gads -and many of the plants in my garden! These are so important to have in our lexicon. I can see a feed like Urban Dictionary for gardeners. You would be the one! H.
A Specialized Booklet of Gardening Terms is in your future. Put me on the list to purchase one...I love these! Not a lot of verbs (action words) there. Great post! I can see this catching on. Ah! Finally a definitive list of Carol-isms! Very nice. I'm at the office today so that means I'm hard at work catching up on reading blogs. Your posts have had me snickering to myself and occasionally laughing out loud (good thing I'm down here by myself). I'm disappointed that horthead is not in the lexicon. You may add it if you agree to put my picture with it as an example of one. These are wonderful! And very useful too. Your blog is always so entertaining. Saw your tweet, Carol, and am raising my hand to agree that 'horthead" belongs here, too. I kind of like florafishing - when you throw out lines or phrases in a social gathering with a horticultural hook to them, in hopes of getting a bite from a fellow horthead! Very informative and very useful as well. I always appreciate being able to expand my garden vocabulary, Carol. I have a lot of forgetias in my garden--thanks for giving me the correct name:) And just how do you pronounce clematis? I say cla-MAT-is, but one day I heard Martha Stewart pronounce it CLEM-a-tis. Or was Martha just being a haughtyculturist?? Oh, those ring so true!